15 kilometres off the coast of Sumbawa, east of Bali, lies Moyo, a beautiful island surrounded by the turquoise waters and untouched reefs of the Flores Sea. Here can be found Amanwana, the only resort on this island of 350 square kilometres with vegetation ranging from savannah to tropical jungle. The journey from Bali is a 65 minute float plane experience, arriving in the waters of the bay directly in front of Amanwana. A daily menu of Asian and Western food is served in the Dining Room, an open air pavilion with a soaring 15 metre roof made of bamboo. 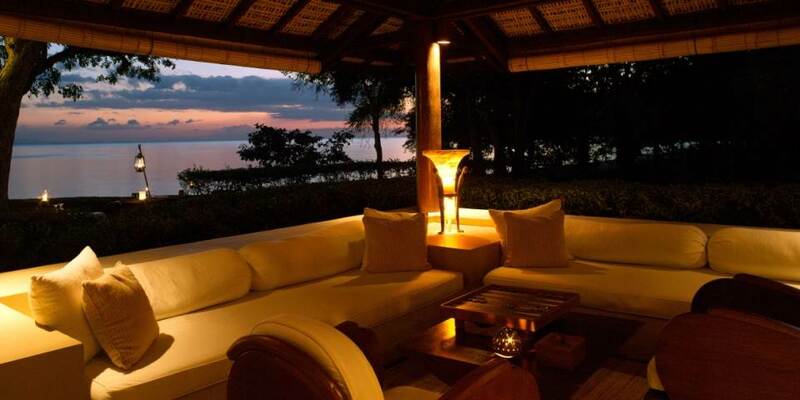 Indonesian hardwood flooring and solid coconut pillars support the structure which has views out over Amanwana Bay. Romantic camp fire dinners on the beach and starlight cruises may also be arranged. Moyo is a haven for hikers and nature enthusiasts. The hilly island’s forest is filled with a variety of animal life, from deer and macaque monkeys to wild boar. Sea eagles, kite and osprey claim the island’s skies. A number of walking trails radiate out from the camp with guides available for trekking. One memorable experience begins with a speedboat run north to the village of Labuan Aji. From here, take a four-wheel drive vehicle into the jungle, then a short trek along a path shaded by tangled leaves and vines ends at a magnificent series of waterfalls cascading into terraced, limestone pools which are ideal for swimming. The waters around Moyo are a diver’s paradise with numerous sites such as Panjang Timur or Turtle Street are just waiting to be explored. Only a short boat ride from camp, Panjang Timur is a deep slope harbouring a variety of hard and soft coral, including staghorns, gorgonian fans and sponges. An abundance of reef fish and larger pelagics, including Napoleon wrasse and eagle rays, may also be found. Turtle Street is a reef ledge, just to the right of the camp which drops away to a sandy slope. Here Hawksbill and green turtles frequent the area, along with moray eels, lobster and black- and white-tip reef sharks. Night divers will delight in the Sea Wall a vertical face which descends 40 metres in front of the boardwalk.Those who prefer tosnorkel will not be disappointed with the variety of fish and coral life to be found in Amanwana Bay, the marine reserve in front of the camp. Guests can snorkel from the Amanwana jetty next to the Boardwalk, or from the beach in front of the tents. Guided night snorkelling is an exciting option also on offer. During the day, Amanwana’s beach boys will also happily provide guided tours of the local reefs. Amanwana maintains a number of boats for cruising, fishing and diving. Choose your vessel and explore nearby coral coves and beaches, ideal for shell collecting, beachcombing, snorkelling and sunbathing. The star of the fleet is the custom-built, 32-metre Amanikan – a coastal cruiser featuring three above-deck cabins, a foredeck with bar for outdoor dining, and extensive dive facilities. Ideal for easing away muscle aches after jungle treks or invigorating mountain bike rides, the open air Jungle Cove Spa is a haven of relaxation. 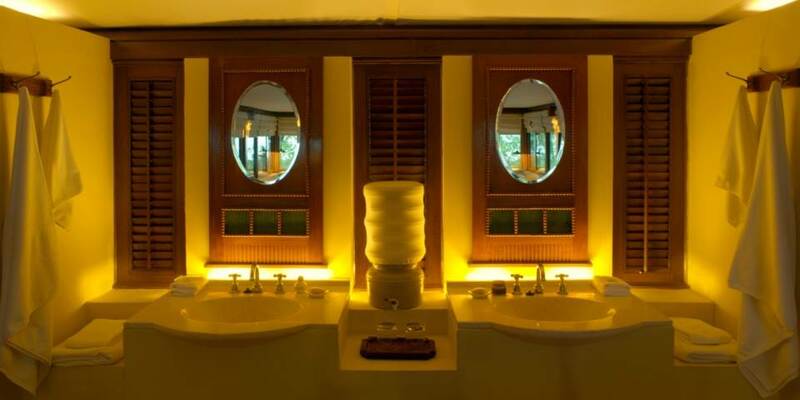 Treatments include massages, scrubs and fresh fruit facials; all using Aman’s unique natural organic products. 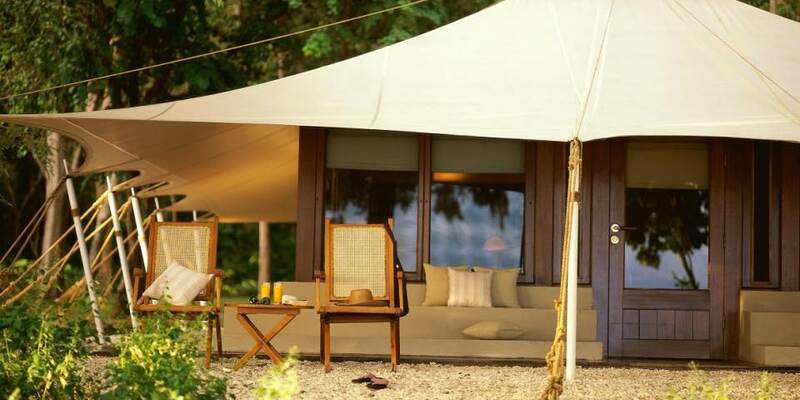 The camp’s 20 luxury tents are set under a canopy of tropical forest, each of which is constructed on a solid foundation from which rise wooden walls with large picture windows. 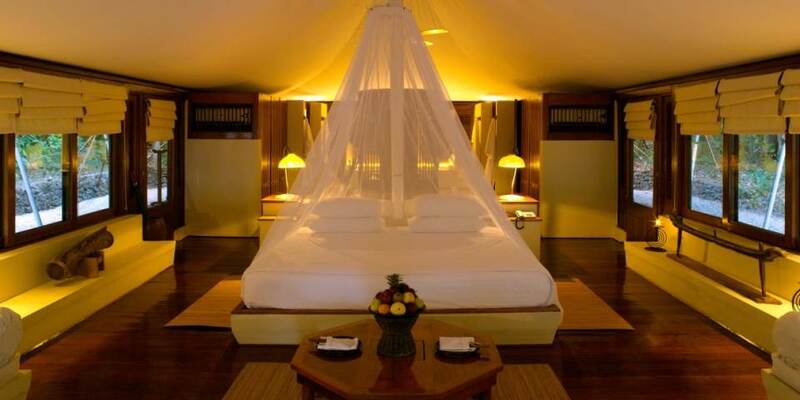 Inside, the air-conditioned tents feature Indonesian island artwork, hard wood flooring, and a spacious sitting area with facing divans, a king-size bed, a writing desk and a large bathroom. Outside a hard wood deck is surrounded by coral stone and sand paths lead to the beach, other tents, the dining room and reception. The only difference between the tents is location; Ocean tents have a beach setting while Jungle tents are for those who like to be closer to the jungle.